Packed with antioxidants, the humble ginger has a whole range of health benefits and is a 'must-have' in your kitchen! Even one sniff of ginger tea can improve your mood, relieve stress and is great for digestion and aiding the absorption of food, experts have claimed. Stomach acid is crucial to human digestion and when stressed its production can break down. Hot water with a slice of lemon and chopped ginger is an excellent way to stimulate digestion, experts. "Ginger can help as it stimulates the taste buds, triggering digestive secretions. "Ginger contains a potent antioxidant, gingerol, which helps cleanse the harmful chemicals our bodies produce when we're worried, so ginger can help psychological stress too. Ginger can also impede motion sickness, reduce inflammation, fight common respiratory problems and encourage normal blood circulation. 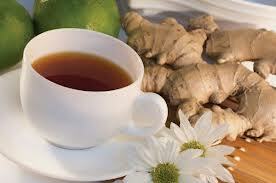 For ladies, placing a hot towel drenched in ginger tea on stomach provides relief from menstrual cramps.